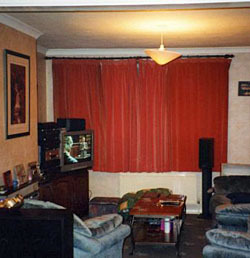 I love watching television and movies although I don't get out to the cinema much since investing in home cinema. I try to be selective so as to leave time for real life. I like sci-fi, action and adventure. See my DVD collection. Earth's biggest movie database for all your movie info requirements. price comparison site for the cheapest DVD's (Books, CDs, Games). online DVD shop with CDs and games. online DVD shop with CDs, games and more (was CD Wow). online DVD marketplace with CDs, games, books and more. Panasonic TX-32PK1 32" Widescreen Television. Panasonic NV-HS860 and NV-SV121 S-VHS Video Recorders. Yamaha DV795RVX HiFi AudioVisual Amplifier/Receiver. Sony VTX-760U Satellite Digital Decoder. Nokia Mediamaster 221T Terrestrial Freeview Digital Decoder. Yamaha CDC-585 5 Disc Carousel (flatbed) CD Player. Technics (now Panasonic) RS-B905 Cassette Deck. Sherwood (Richer Sounds) PS-9700 Record Turntable. Mission 772 & 77c Main and Centre Speakers. KEF Q60 SP3225 surround speakers. REL Acoustics Q100E active subwoofer. QED Qudos silver speaker cable. the best consumer electronics as determined by the European Imaging and Sound Association. home cinema news, reviews, articles and information. 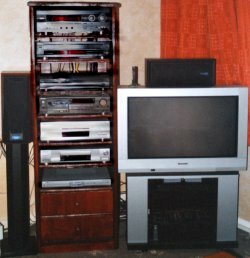 Sound and Vision home entertainment buying guide. you don't want to get "capped"
"my wings are like a shield of steel"
for Mr Jinx (the cat) quote: "I hate mices (mieces) to pieces". "It's quiet" said Roobarb. "Too quiet." said Custard.